Stroll into any of the big DIY supermarkets, wander down to the timber section and no doubt you’ll be met with an array of furniture board in various widths and lengths, consisting of a chipboard core covered with a melamine faced wood veneer. At one time, I vaguely seem to remember that they used to use real, proper tree wood but a swift t’interweb search has drawn a blank. At the best of times, this stuff is hideous and the shame of it is that it doesn’t even have the good grace to burn properly on a bonfire. If you’re unlucky enough to try and build anything with it, it’ll be sufficient to put you off making stuff for life. The upshot of this unfortunate state of affairs is that there appears to have been a public reaction away from anything made from this type of material, recently illustrated by an infuriating, ‘zapper’ inducing and intensely irritating series of advertisements on the TV. You don’t need to be Professor Stephen Hawking of Rider Reversa fame to know exactly which ones they are! In some ways, this is a good thing but it does tend to tar all veneered furniture with the same murky brush and, as the lyrics of the fabulous Gershwin melody from Porgy & Bess indicate, ‘It ain’t necessarily so’. To begin at the beginning, it’s obviously pertinent to ask ‘what is veneering?’ Put simply, it’s covering a base or core timber with another expensive or more highly decorative wood. The first examples of the technique appeared in early 17th century Europe when diagonally cut ‘oysters’ of laburnum (Laburnum anagyroides) were used for decorative purposes. 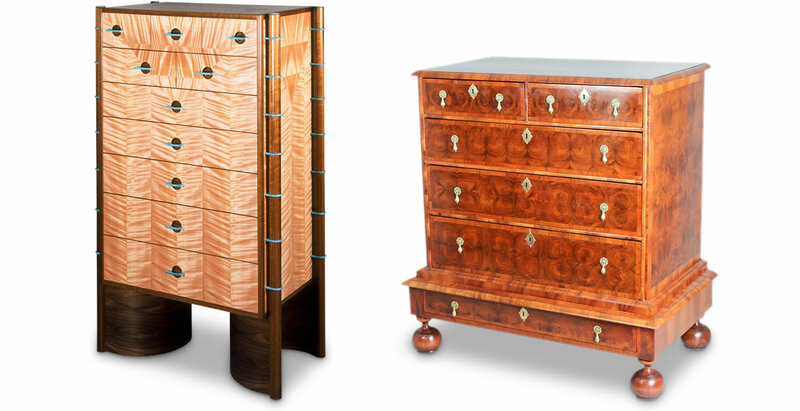 Left: Robert Ingham chest of drawers. Right: William & Mary chest in walnut with laburnum oyster veneers. Moving on to the present day and looking at contemporary furniture, veneering is a way of not only enhancing the decorative effect of the timber, but also ensuring that scarce and rapidly diminishing resources are used in the most efficient way. Those resources should, in an ideal world, come from a sustainable source. Veneering also allows the furniture maker to use many different techniques that couldn’t be done with solid timber. This stunning piece by Robert Ingham amply illustrates the way that the veneers can be used to maximise the decorative effect in a way that would be well nigh impossible otherwise. Most of the work done these days is with commercial, thin veneer and although I still use it occasionally, I now tend to use bandsawn stuff which I produce in the workshop and these much thicker veneers require slightly different techniques to join and lay. The last picture shows the top of my wife’s chest of drawers, which is the current project in the workshop. It’s being made in English oak (Quercus robur) with a top veneered in English walnut (Juglans regia) and the veneers used here are 3mm thick. 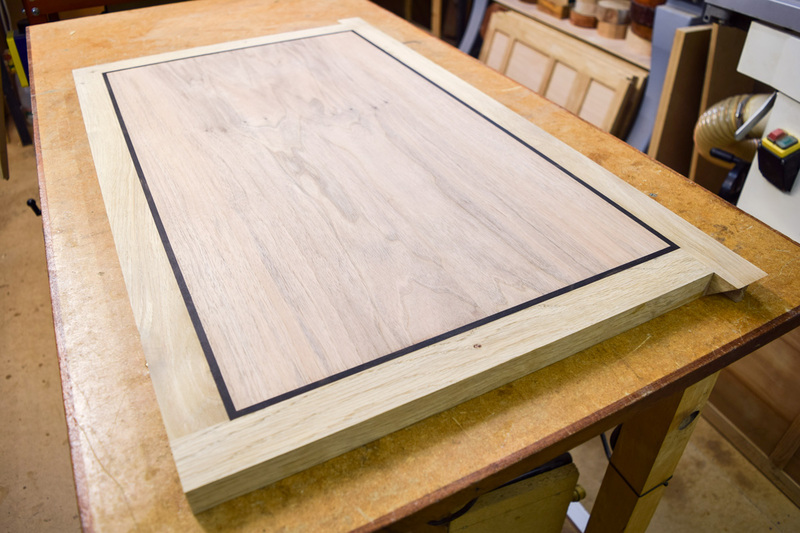 Over the course of the next few AxBlogs, I’ll be exploring some different aspects of veneering and, as usual, if you have any comments or questions please leave them below.